"Céad mile fáilte from the Beach Bar, Templeboy, Co Sligo"
The Beach Bar, Aughris, Sligo is a traditional Irish Thatched Pub and Restaurant, with a Bed and Breakfast Accommodation in a beautiful location beside the sea. 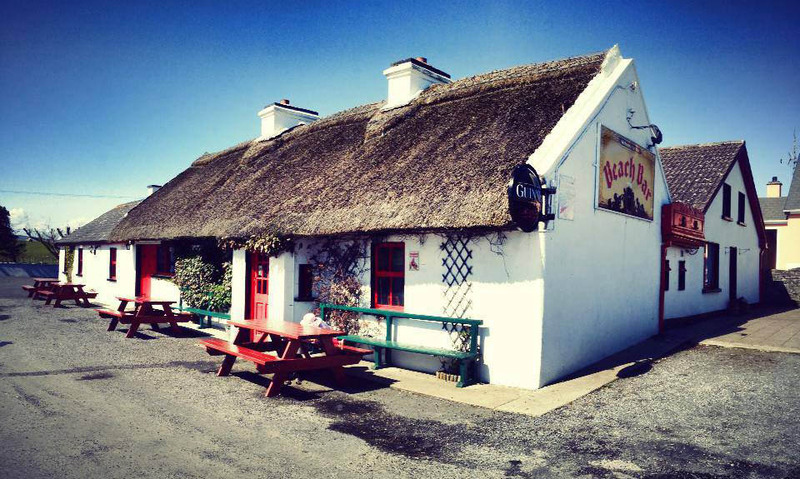 This old world traditional Irish pub sits peacefully on the unspoiled Aughris beach in Sligo bay, with the Atlantic waves rolling in outside the front door and the Ox mountains overlooking behind. The majestic peaks of Knocknarea and Benbulben compete for your attention to the east. One of Irelands truly old-style pub-restaurants, the attractions of the Beach Bar are as interesting and diverse as the clientele it attracts. Unwind with a cool beer as you soak up the character housed within the thick walls of this thatched establishment, which boasts a tradition going back 300 years. Warm up with an Irish coffee in front of a cosy, open fire in the winter or chill out in the beer garden with a cool Atlantic breeze on your face in the summer – this is the pub for all seasons.